Classic French cakes really cover some territory. Some of these gâteaux (that is the French word for cakes) are quite humble, but in general the more layers of cream, chocolate and frills, the more popular they become. Warning: All of these French cakes can certainly not be considered easy to make. Some of them are so elaborate, they will take hours to prepare. Nothing is to stop us from a little window shopping though - sometimes it is fun just to consider the possibilities. Much easier on the waistline as well. On the other hand, if you are ready to start baking, have a look at these easy French cake recipes. A baba au rhum is made from a yeast cake, similar to a brioche , that is imbibed in rum . These might be made individually or in one large ring, called a savarin . Many times they are served with candied fruits and whipped cream . Although this takes the form of a cake, so it is included here, a bavarois is more correctly called an entremets , a sort of cold dessert. It is made with cream and many times different fruits and set with gelatin . These can take on many flavors and colors. Bûche aux MarronsAs you may already know, a French bûche de noël is a cake that is made to look like a log and is eaten at Christmas time. 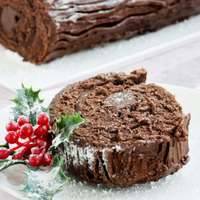 A classic interpretation of this, a bûche aux marrons includes pureed chestnuts and chocolate. CharlotteA special mold, called a charlotte mold, is lined with brioche, lady fingers or some other sort of cake. The center is then filled with any number of different ingredients. Common interpretations include apple charlotte, pear charlotte, and chocolate charlotte. CroquemboucheSmall choux pastry shells are stacked into an inverted cone sort of shape and then held together with caramel. A croquembouche is a common wedding cake in France and they can be extremely elaborate. 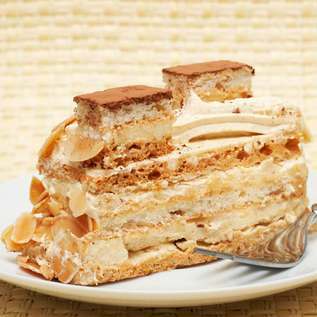 Dacquoise A dacquoise is made from layers of meringue that usually include some ground almonds. In between the layers, you might find just about anything sweet and yummy. Délice, Fondant, MoelleuxI am putting these chocolate delights into one group. These are all very easy French cakes that are made with lots of chocolate and butter and very little flour. You can imagine the result. 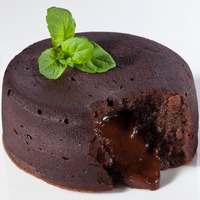 A moelleux actually has a liquid center - a sort of chocolate lava cake, but all of these are very moist, simple chocolate cakes. FrasierThis is a layered cake that includes fresh strawberries. 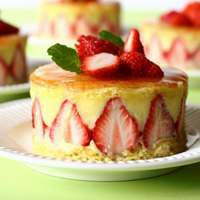 Typically a génoise cake (that is a sort of sponge cake) is layered with pastry cream and the fruit is added in such a way as you can see slices of strawberry on the outside of the cake. Foret-NoireYou may already know this one as black forest cherry cake. Although German in origin this is made so often in France that it really should be included in our list of French cakes. 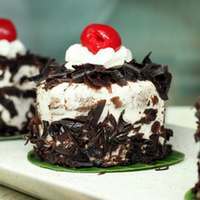 Chocolate cake is layered with brandied cherries and whipped cream and decorated with shaved chocolate. Galette des RoisThis is served at the start of the year to celebrate Epiphany. Puff pastry is filled with almond cream and a fève, which used to be a bean, but now is more often a small porcelain figurine. Whoever gets the fève is crowned king or queen. A pithiviers is very similar to a galette des rois, but without the fève. Seriously, I think you have to be French to understand the difference! Gâteau BasqueA very simple cake that includes a layer of raspberry jam between layers of cake that are almost like a short bread. MokaLayers of genoise cake are filled with coffee flavored buttercream and carefully decorated with more buttercream and sliced almonds. 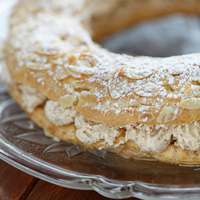 Paris Brest Pâte à choux (that is what cream puffs are made from) is baked in a ring that is then sliced in two. 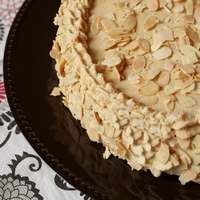 It is filled with a hazelnut buttercream and decorated with toasted almonds and powdered sugar. Petits FoursSmall, bite sized cakes that are made from many different things and in many different ways. 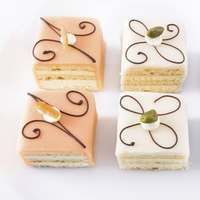 A classic petit four is made from small squares of genoise cake frosted with fondant or butter cream. Quatre-QuartsThis is the French version of a pound cake. Equal weights of flour, butter, sugar, and eggs are mixed together. Many times this takes on lemon or chocolate for a flavor. Saint HonoréA sort of puff pastry cake is topped with a ring of cream puffs that have been dipped in hot caramel that then hardens. The center of the ring is filled with whipped cream or a more elaborate pastry cream. 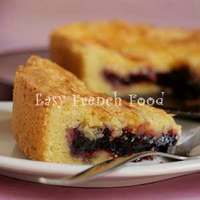 Now that you are ready for a bite of these French cakes, go on to explore all sorts of other wonderful French foods.